I know I said I’d stop with the whingeing, but seriously…what’s with the weather? Friday all day was beautiful and it was hot and I was dying for a swim. Then I left the office and the heavens literally opened and there was thunder and lightning and a deluge from above. I sheltered a little and debated what to do. And the rain cleared again. I headed for the beach. It was still damn hot…the rain hadn’t stuck around long enough to really cool anything down. The beach still looked great, and we headed down for a swim. Oblivious, we had walked into quite a shock…the water temperature had dropped sharply and suddenly and it was bloody cold!! Now, to be clear, I generally don’t have too much of an issue with the colder water. I prefer swimming without my wetsuit, whenever I can manage it, and I do find that once the shock of getting into the water passes it can be quite pleasant to swim in cooler water. That being said….a certain amount of mental preparation is necessary, and to find the water temperature had dropped several degrees was kind of shocking. I particularly love this one of Bel S sharing a story about Friday drinks…completely oblivious to the surprisingly apt wineglass-shaped cloud behind her…. Fittingly, the temperature may have been a little challenging, but he waves were definitely not. They weren’t huge, but they were those great ones that you can catch by throwing yourself off the second sandbank….completely safe but very catchable and with just enough oomph to give you a decent ride right up to the sand. Excellent opportunities for party waves for as long as our frosty toes allowed! I’ve said it before, and I’ll say it again….Friday night swims are my favorite swims. We generally have a big weekend ahead of us, with at least one session (sometimes 2 or 3) on a Saturday, and most of the time a race on Sunday, so there’s no real reason to go too hard with things. It’s just an opportunity draw a line in the (literal!) sand of the week and let the weekend begin! These swims, more than any others in the week, are about the sheer joy of swimming. The perfect time to invite someone along to show them how and why we do it! This week I invited along someone very special. 20 years ago I finished high school…and at that time I had a lovey friend call Penny T. As sometimes happens when everyone heads off in their own directions after finishing school, we lost touch. Then, a couple of weeks ago, due to the magic of Facebook, a little effort, and a change encounter in the Bondi surf, Penny popped up in my life again…visiting Bondi for a holiday from Darwin, where she now lives. And somehow, good sort that she is, Penny let me talk her into coming along for a Friday night swim! Penny & Jacki – a 20 year reunion! 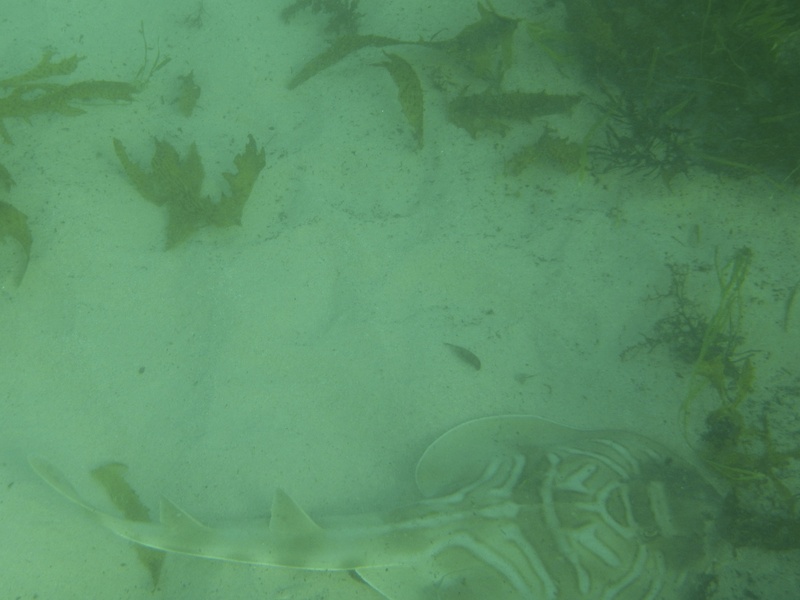 Luckily, Bondi put on its best for her….gorgeous conditions, the supportive, non-competitive environment of 4SEASons swim, and a little bit of a wildlife treat….a Wobbegong! Wobbegong – watch out…shark about! 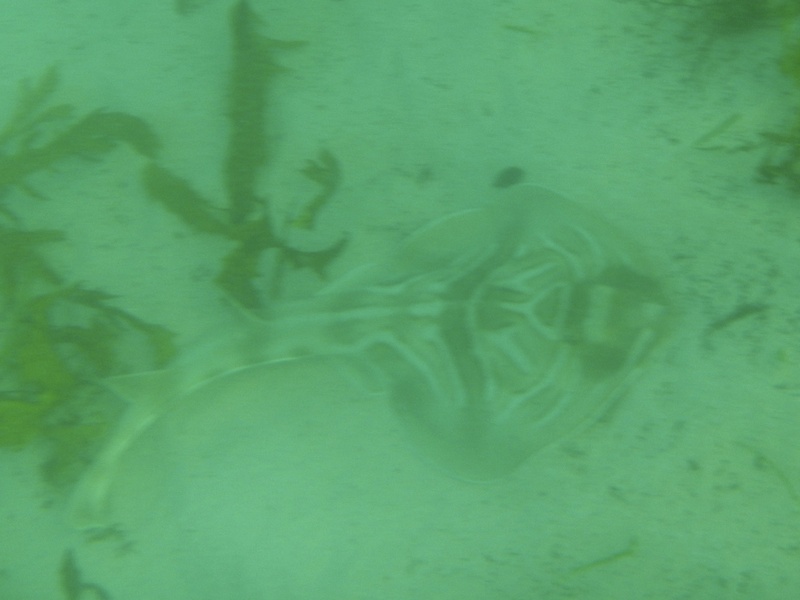 This was quite a treat…out near the open sand of Bondi. I’ve seen these guys diving before, and once at rocky Clovelly, but usually they like to hide under rock ledges and you only get a glimpse. This one was up and about swimming around in relatively shallow water. 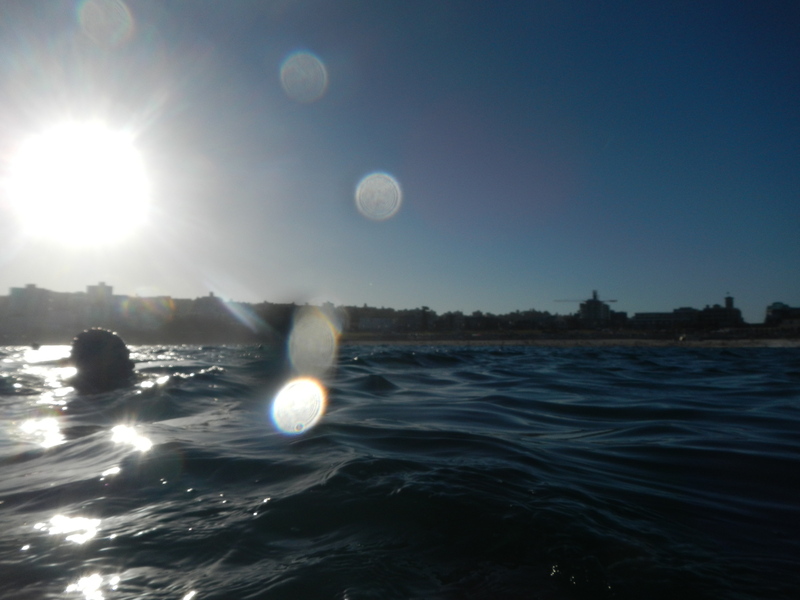 The other joy that Bondi provided on Friday were some bloody beautiful body-surfing waves. Armed with a replacement camera, and a friend to take a few shots, I once have photographic proof that I can, indeed, catch a wave! 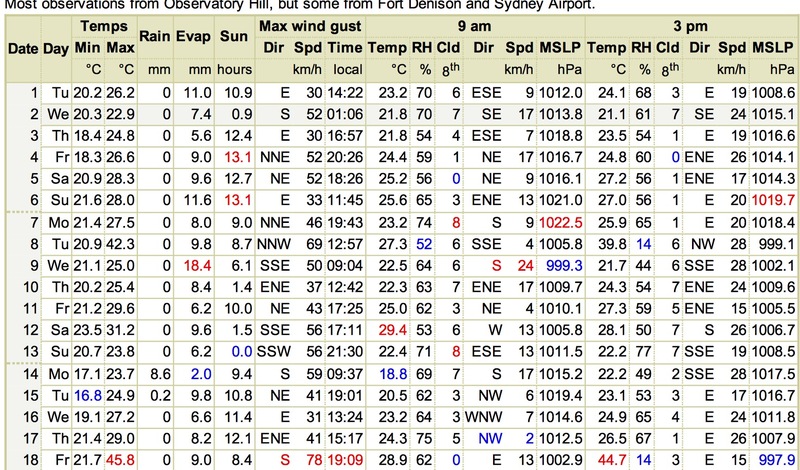 just a fraction under 2km all up…including warm up and ins n outs at the end. The eve of a long weekend, One of Australia’s most hallowed and revered. The weather? Divine. Hot, but not stinking hot. Not horridly humid. Just right. And I’ve been sick on and off for a couple of weeks now. Boo! 😦 So I decided to act like a grown up and take myself off to the doctor. Well…a new diagnosis (you mean self-diagnosis isn’t the way to go? who new?) and new drugs, and within a couple of hours I felt a million times better. By the end of the day I was even ready to leave he house and try a bit of a dip. Salt water helps cure what ails you, right? Seems it was true. I wasn’t quite sure how I’d go, but the cool of the water and the weightlessness made me feel better than I had for a while. It wasn’t a big set, but the water was super, super crystal clear and there were just fish everywhere, Not big ones, but the tiny little stripy ones, and silvery shimmery garfish swimming in formation near the surface, parting without a care in the world and dividing into smaller schools as the swimmers passed. There were families and snorkelers and surfers and swimmers, and the joy of feeling so good after really not for a bit. We did a north end swim safari out to the point and then back along the rocks. And I have never ever ever seen so many fish. They must have been gearing up for a long weekend too! There was bit of shortage of slower swimmers there, and lord know i wasn’t really feeling up to pushing things too hard, so I really swam for the joy of it. Seems I wasn’t the only one…as I spotted one Coach Kingy diving down to frolic and have a look at the natural aquarium…on more than one occasion! 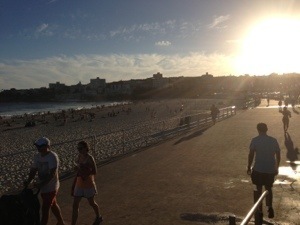 It really was Bondi at it’s best and finest. What a privilege it is to live somewhere I get to do this. All the time! This was Sydney on Friday. Read aaaaalllllll the way to the bottom. Yup, your eyes aren’t playing tricks on you, That says 45.8. Celsius. Or a smidgen over 115 degrees Fahrenheit if you’re from one of those logic-resistant places. So regardless of whatever measurement system you use, the laymen’s term for the weather is “hot as hell”. It was an all-time record for Sydney and the hottest I’ve experienced (if you include the humidity factor) since a beyond crazy couple of days I spent back in ’94 in Namibia…but that’s another story…possibly one I should share at some point because there were a whole lot of swims in the time I spent there and I’m sure they’re at least somewhat relevant to this blog. Not Quite Nemo: The Formative Years, perhaps. It was hot. Hot it was. Hot. Hot. Hot. Hot. Hot. Sorry..the temperature addled my mind for a bit. When It’s that hot it’s a bit hard to focus properly on anything else. All you know is that it’s hot. Really, really, indescribably hot. Days like this are just made for swimming though. There was a pretty decent turn out of 4SEASons swimmers and plenty of punters on the beach. The water was refreshingly cool, and the temperature had already started dropping into a cool change in the evening, so the swim was even more heavenly than usual. We headed up the North end and did some ins and outs using some pretty impressive inflatable watercraft as markers…trying not to get too distracted by the beer-toting occupants! It was kind of strange to be swimming and inhaling these breaths of such hot air, though. Kind of like if you were sucking on the end of a hairdryer. Or how I imagine that would be…not something I actually recommend you try! Ahhhh, thank goodness for beaches and swimming. Made a crazy situation into a joy. Ah, Friday swims…best session of the week in my humble opinion! Last week was definitely no exception. I missed Tuesday training stuck late at work, and then didn’t make my Wednesday Can Too session (booo) as some idiot knocked over my bike where it was parked for the day and broke the clutch lever…making it a little difficult for me to get there. Anyway, a trip to the parts shop, a screwdriver, a shifter and a youtube video later and I’m back on the road and was back in the water. Yay! I was running quite late getting out of the office so raced across and threw my gear down and literally ran down to the beach to join the group for the swim. 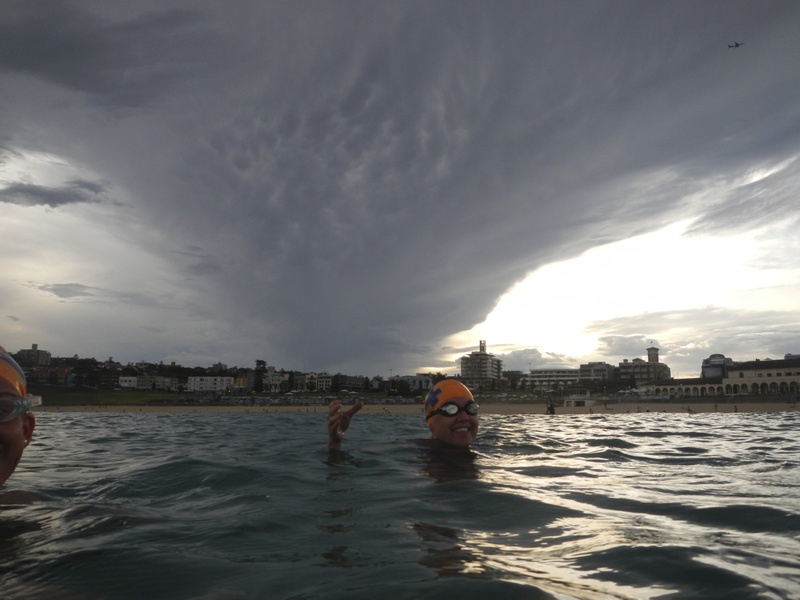 We headed out on a swim safari to the boat ramp at North Bondi, then out and around Ben Buckler with a test of nerve to see how far we would swim out as a group! I love doing this swim, it’s completely amazing to me to see that magical world under the surface, and it’s one of the charms of ocean swimming for me. I remember being so surprised, when I first took up this sport, to find all sorts of sea life flourishing in Bondi. I think because it’s so sandy in the middle, and quite small, and there had always been soooo many people, and I guess never having swum there with goggles and therefore been able to see properly, I had selfish(pun! )ly assumed there wouldn’t really be much in the way of sea life there. Rarely is there a swim where I don’t see all sorts of fish and rays. At the North and South ends there are rocks and seagrass beds which are absolutely bursting with life. On lucky days I’ve seen whales not far off shore, and even luckier had a pod of dolphins come and swim with me, Jules and coach Kingy! On the unlucky days the place is overrun with bluebottles, and there are all sorts of jellyfish out there…luckily most of them seem to be the non-stinging kind. Even though I’ve snorkeled heaps over the years, swum heaps in the past couple, and taken up diving in the past few months, there’s just something about being right in there checking out this completely different world that I never grow tired of. Luckily for me, I live somewhere where the geography and the climate mean I pretty much never have to! I went back to work on Thursday after such a beautiful couple of weeks off. It wasn’t pretty. There’s something about heading back to the office when you’ve had a couple of weeks of freedom, particularly when the sun is still shining outside, that makes it super-tough those first couple of days back. Luckily there are Friday night swims to soothe my soul and revive my spirit, and Friday’s swim was a glorious example of just how lovely they can be. The weather was divine and the beach was packed with holiday-makers. The 4SEASons crew put on a great turn-out and we made for quite a sight weaving through the crowds, and straight out the back and across to the boat ramp. Once out there, with the sunshine and the water pretty flat, there seemed only one thing for it – point to point of course! We set off across the bay and it was a pretty lovely swim. It was so nice to be back in the salt water and stretching out to swim across the bay. Just a little bit of glare! We struggled along, sighting as well as we could. Luckily for us there was some sort of event on at Bondi Icebergs (polo, I think?) so as we got closer we were able to follow the sound of the brass band. Quite possibly the first time I’ve ever sighted by listening! Ahhh…Friday was hot and steamy in the city. A Friday night swim was definitely in order…especially after I hadn’t managed much swimming during the week due to the finger/door incident of last Sunday. This Friday was a bit different to usual training. 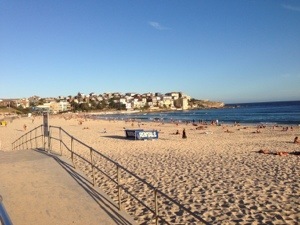 We went to Bronte beach instead of Bondi. Outrageous! As a special treat my sister decided to join us for a refreshing dip too! 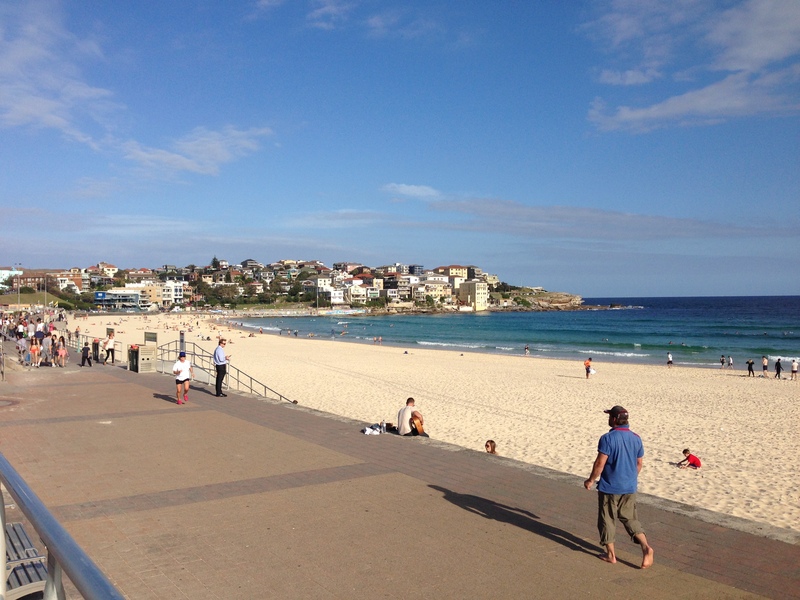 Bronte Beach is quite similar to Bondi in a lot of ways, but in some ways it’s also quite different. The beach in general is much steeper. It’s a climb up to anywhere and the water’s edge itself is quite steep so the water gets deep very quickly. The sand at Bronte is much coarser and more shelly than Bondi. I know this because I body-surfed right up to the beach a couple of times and ended up with a not insubstantial amount in my swimmers! 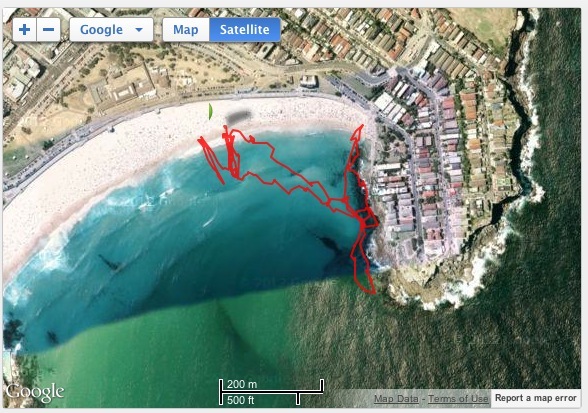 Bronte is a bit smaller than Bondi, and has more of a central rip instead of the two you normally get round the corner. A lot of fun grabbing that little express right out from the middle! Unfortunately I did have a bit of a drama…my trusty (well maybe not so much in hindsight) Pentax decided not to work while I was in the water. When I got it home I realised why….the whole thing was full of water and the battery had leaked. The whole thing was toast. Boooo. There’s an upside to everything, though..I did a bit of research on the weekend and made a new purchase so watch this space for a review of my shiny new camera! Woo hoo, it was an absolute cracker of a weekend, and it all started with one stunning Friday night swim. The sun was shining, the air was warm, the water temp was good, and the water clarity was as good as it ever gets. Even the tourists had come out of the backpacker hostels and were down on the beach having a swim. 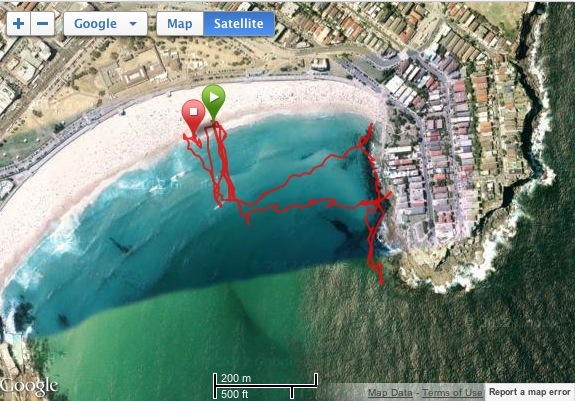 We did a swim across to the north end, with a trip into the beach and back out halfway. Then it was one of the famous Friday Zoe’s swim safaris out the rip, to the boat ramp, then further out to the head. It was pretty stunning…with such clear water and good light we had a great view of all the fish and the rays and the sea grass. It still amazes me that even at a beach like Bondi where the are always people around, and where that’s been the case for such a long time, that there is so much wildlife down there. It’s pretty special to be able to be out there interacting with that environment, and in such beautiful conditions it was a real joy to be swimming. Sometimes it’s tough training, if there’s jellies, or you’re having to choose it over some other activity. But other days, it absolutely feels like something you do for pleasure, and Friday was most definitely one of those days! Anyway, I’ve had the odd day like this before, and usually I know myself well enough to know that if I make myself go to training, all those feeling seem to melt away as I dive under that divine first wave, and the quiet and the challenge and the focus on just keeping swimming take over…and I have never yet had that not work. Well, it was working OK. I was swimming without a wetsuit, as usual at the moment…it’s too much of a hassle getting the thing on and off, the water is warm enough I don’t even miss it, and I have enough trouble carrying around stuff for work, for swimming, and stuff for motorcycle riding (including all the required wet-weather gear for today) that it was the last thing I wanted to pack. So the training session would have been fine, except for the bluebottles. Yep, the nasty things, good for nothing other than the dubious honour of being turtle-food (and not even terribly good at that) were infesting the beach. Out of the group swimming today (8 of us, I think) Allison was the only one who wasn’t stung, and the ratio of wetsuits to news was 5:3. I’m a bit lucky, I suppose, in that I don’t actually seem to react too badly to stings from the nasty blue guys. I’ve been stung plenty of times at Bondi, and plenty of times as a kid (perhaps that’s part of it) and it never seems to be too bad after the initial shock of the sting. Tonight, however, I discovered that getting stung in the underarm with the tentacles wrapped down around my arm, over my shoulder, and up around my neck, is a touch more painful than in other places. In fact, it hurts quite a lot! I pulled the perpetrator off my skin, and I did keep swimming for the rest of the session…which I’m kind of glad to admit didn’t go for the full hour tonight (something about the rain and the recurring jellyfish stings, perhaps?). I can’t honestly tell you that I enjoyed the rest of the session though, The thing is, once you’ve been stung, the rest of the session you do have a bit of a tendency to get a bit jumpy and edgy at every bit of seaweed, and every stray wave that laps at your toes. I know it’s all a bit pathetic compared to some of the full-on marathon ocean swimmers who get stung repeatedly by much nastier creepy crawlies than that, but I’d like to make the disclaimer that I’m saying I didn’t enjoy myself, not that I couldn’t have kept going if I’d really had a good reason to. Anyway, we did call the session off a bit short, and then everyone pretty much split and headed straight home. I had an equally miserable ride home in the pouring rain and freezing cold, and was feeling more on the verge of a Claire Danes Cry Face than my usual post-swim sense of happiness, joy, wellbeing and elation. It’s interesting to note that even when you love something, it’s never perfect all the time. Helps put in perspective the things that are perfect less of the time. 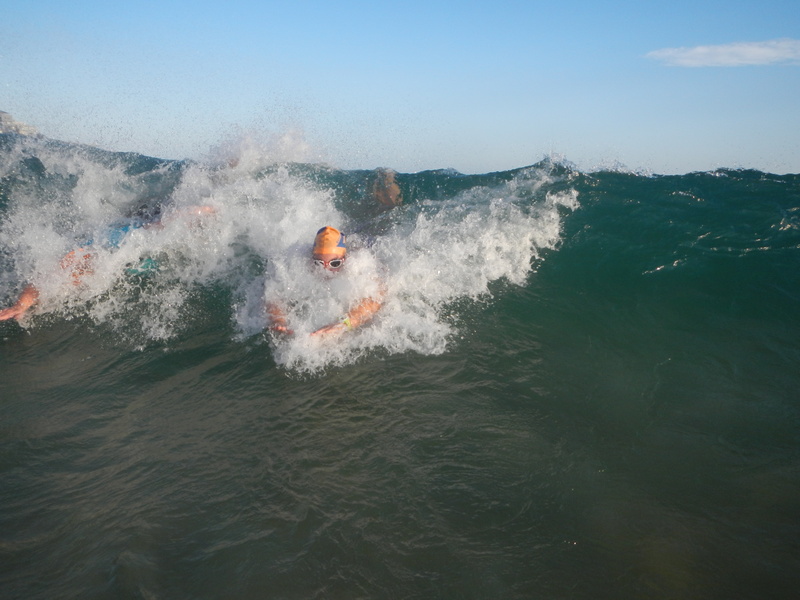 Ocean swimmers are tough! And brave! We kept going several rounds even after pretty much everyone had been stung and was hurting, and not one person gave up, stopped swimming or opted out til we called the session (admittedly a touch early) at the end. Tough training days like this help keep things in perspective during races. It may be a little rough or not as nice a weather as I hope or somehow suboptimal, but I’ll still know I’ve survived worse! Bluebottles are actually kind of interesting creatures when you’re out of reach of their tentacles. My trivia-loving partner had a bit to do with that one when he got home. He knew, for example, off the top of his head that they are actually made up of two different organisms, and that where the bubble part of their bodies (the sail, apparently) joins their tentacles, they can change the orientation to ‘sail’ with the wind. Also, according to the combined efforts of the 4SEASons crew, I now know that they are popular food for turtles (and a few other things). Yes, you read that correctly…summer is here, Can Too Training throws out our normally scheduled programming, and a whole new routine starts from now. And it begins with the long-awaited return of the Friday night swim!!! Hooray!!! 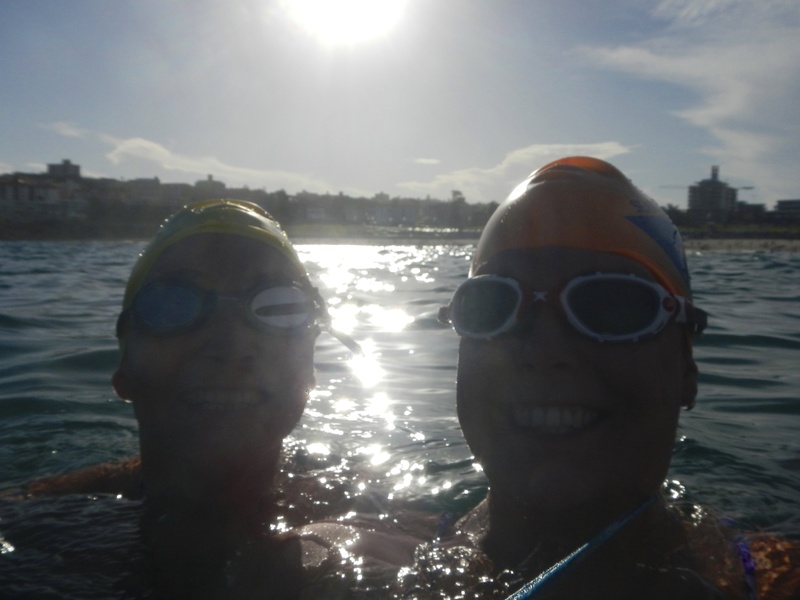 Last year we did Friday night swims at Bondi and it fast became my very favourite swim of the week. I didn’t have my motorbike last summer, so I was only able to go when I could be assured of someone heading back in my direction (public transport options from Bondi Beach to where I live are pretty disgraceful, and involve at least 2 changes). This year, I’m hoping it will be a regular fixture as I can easily zip out of the city to Bondi, and get home in 15-20 minutes afterwards! This Friday did not disappoint in any way. The weather was glorious…beautiful golden light, warm water, just a few little shore-breakers but nothing too messy in terms of waves, and a relaxed crew of smiling swimmers who also understand that there’s no competition when deciding between Friday night drinks and a Friday night swim. There’s just something about it….after a hot and sticky week in the city (OK, so there was a crazy hailstorm at lunchtime, but it was still hot and sticky the rest of the time), there’s just nothing like washing of the dust and grime and the cares of the week with a swim. It signals the true end of the working week and the glorious beginning to the weekend! I also didn’t have my underwater camera last year, and discovered that the evening golden hour light produced some magnificent swimming photos. I don’t have the files with me, so I’ll have to try to remember to add in a slideshow or similar soon, but they’re definitely worth checking out on my Flikr page as they’ll give a good idea of just how lovely it was. Ah, just divine. Welcome back Friday night swims. I’ve missed you! !